I don't understand. On the photos, white version has only Sony name, but on the black version there is old SonyEricsson name??? ... just a couple of weeks after i bought my xperia arc. worth an upgrade you reckon? I don't like sony giving up on physical keys. I own an X10 and wanted to stick with sony ericsson because they had a distinctive design, they used to differentiate from other brands, now the Ion looks like another samsung or motorola. I had high hopes with the leaked images from nozomi but now it doesn't fully convinces me. It looked more curvy and the bottom lights look dim. Still think the X10 and arc are amongst the best looking androids out there. On SONY xperia S, that 3 button symbol home, back and apps are they like see through? Coz we can see them at the back of the phone also.. And I knew it, they will not let the design too square and brick.. lil curve at back makes it better.. Both colors are look great anyway.. Good Job SONY! 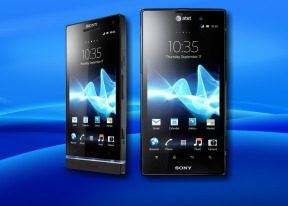 Sony Xperia S borrowed the same design principle in SE Satio? MIHAI, 10 Jan 2012Uuuuu...SONY is back! G-R-E-A-T-! Have always loved Sony product...gues thatb the Ericsson ... moreIt was always the Sony bit which dragged its heals. e.g. Sony Ericsson wanted to make a PlayStation phone 5 years ago, but Sony would not let them because it wan't Sony branded. Just one example of many. These are all Sony Ericsson designed phones anyway. why is the sony ericsson logo still on the back ? They have NFC and I think Sony was the main event in CES. The Titan II dropped in shadow after Sony's phones. Have always loved Sony product...gues thatb the Ericsson bit only pulled them backl. it's now a couple of month since the divorce and already a couple of AWESOME Sony-all-the-way phones are...on the way! BIG thimbs UP for Sony! Great job as always, Sony! Altough camera on this looks too smaller for a 12mp(look at Nokia N8 for the difference) and probably won't gonna have SD expansion slot, Xperia ION won me. This is the firs phone since Xperia X1/X2 to actually have some metal in it. Yeeeey! The list continues with 16GB of internal storage, PlasyStation certification and Android Gingerbread that should be upgraded to Ice Cream Sandwich soon after launch. All I would say about quad-core, etc. etc. I agree in the main, I think one year of dual core is not enough before jumping straight for quad - however, if they prove to be more battery-efficient, then there's really no harm (it just means an even smoother experience) and having a GS2 I reckon it could do with a speed-bump - it's excellent as it is, but when I upgrade this year I'd like to think my phone was 'improving' over last year's specs!